The second operation after hay mowing is raking, which has the purpose of collecting your mowed grass in line for easy baling. 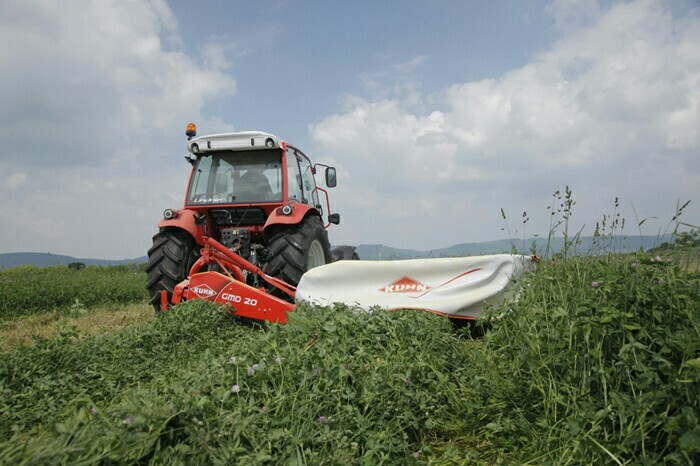 Kuhn rotary rakes produce fluffy, well-informed windrows to help you dry your hay faster. This allows you to harvest your crops at at their peak nutritional value with less reliance on the weather. Long flexible tines touch the crop just once, lifting and depositing it neatly into the windrow. The gentle raking action ensures that the leaves remain intact for maximum quality. Kuhn rotary rakes are available either as multi rotor system or single rotor with the latter featuring a reliable grease filled gearbox and double bent tine arms for superior raking quality and gentle crop handling. The three points mounted rakes with working widths not less than 3.20m will give you a superior raking performance, while keeping the leaves of your crop intact and allowing you to harvest at peak nutritional value. They have a fully enclosed single-stage gearbox which is greased filled and sealed to be maintenance free ensuring a long life. For additional security, the tine arms holders are fixed on both the upper and lower gearcase covers. Kuhn tines, rake the crop gently, yet thoroughly, even in dense heavy crops. Their heat treated steel construction helps ensure a longer service life and maximum resistance. The rotor wheels on Kuhn rotary rakes are positioned extremely close to the tines, this is to allow the tines to follow ground contours minimizing contact with the ground to avoid incorporating impurities into the windows. An optimal mounting of the suspension ensures an optimum balance of the cutter bar. Precise adjustment of the ground pressure, the cutterbar only exerts limited pressure on the soil. In this way, the sward is preserved and the forage not contaminated. The maximum PTO speed should be 540 rev/min. in order to achieve the desired results.